Wenger Men's Watch. Swiss Made.100m. Wenger Men's Watch. Swiss Made. 100m Water Resistant. Mineral Crystal. 40mm Case. On NATO Strap. Will Post Royal Mail 1st Class Signed. Will Only Post In UK. For sale is a Wenger Seaforce Chronograph 200m water resistant watch in its original case complete with instruction booklet. The watch is in near as new condition, there is a very small blemish on the bezel between the 35 & 40 markers (I only noticed it in the photo, not when looking at the watch. 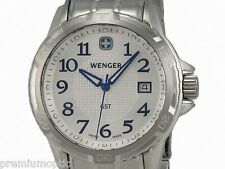 A Gents Swiss Made Wenger Quartz Watch hardley used Esso Logo on the Face GWO. Has its Original Leather Strap Marked With the Swiss Cross and comes with original box Condition is Used. Dispatched with Royal Mail 1st Class. The model code is 01.1741.106. Wenger is part of the Victorinox Group. New and unworn, Wenger URBAN CLASSIC gent's wristwatch. The RRP is £209.00. The case size is 42mm. The lug spacing is 22mm. Mens Wenger Swiss Watch in great working condition features day date and water resistant to 100m , sapphire coated crystal and a nice heavy duty black rubber strap. Quartz movement no box supplied but will be well packaged . Grab a bargain . Wenger 01.1841.102 Roadster Black Night Swiss Men's Watch Black Silicone Strap. Dispatched with Royal Mail 1st Class. It's about 9mm thick and has a single winder. It's battery operated. This would make a great gift. 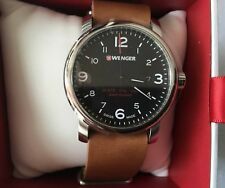 Wenger Roadster Men's Watch. Swiss Made. 100m Water Resistant. Sapphire Coated Crystal. Strong Lume. On NATO Strap. Will Post Royal Mail 1st Class Signed. Will Only Post In UK. Squadron Chrono Chronograph Gents Watch byWENGER. - All original Wenger manuals, Presentation Box & Certificate of Authenticity. Worn by professionals and civilians, the Squadron Chrono 77055 Swiss Watch is a symbol of Swiss reliability, durability and leading edge design. The model code is 01.1741.125. Wenger is part of the Victorinox Group. New and unworn, Wenger URBAN CLASSIC gent's wristwatch. The RRP is £209.00. The case size is 42mm. The lug spacing is 22mm. Compass Direction. Sapphire glass crystal. Electro-Luminescent backlight. Dial Window Material Type﻿ Sapphire. Strap Colour Black. Band Width22.0 mm. Clasp Type Buckle. Band length160 - 220 mm. Strap Material Leather. Strap information. Water Pressure Resistance10 bar. In tribute to the Arctic Light Project, Wenger has decided to create a Special Edition Set, presenting a Wenger Seaforce diver’s watch and the Uri Golman Arctic Light photography book in a convertible waterproof utility case. Make a bold statement when you wear one of these handsome wenger men's wristwatches. These wenger watches are often wider with larger faces for an eye-catching appearance. PVD coated band wristwatches are crafted from very strong materials for durable designs. They have scratch-resistant straps for added durability. Plastic band watches have a casual style, making them great for any activity. They feature lightweight builds for an extraordinarily comfortable fit. Analogue wristwatches are available in a range of styles from Roman numerals to thick lines and traditional Arabic numbers. Designed with functional and stylish displays, they will help you always arrive on time. LED wristwatches are very easy to read. Typically designed with a quartz crystal and a tiny digital computer in order to keep track of the time, they have superior accuracy. Commonly used in the late fifties and sixties, the tuning forks produce a quiet humming sound. These watches are designed with precise movements and give off gentle humming sounds, so you can be sure that they are operating effectively. Automatic quartz movement watches tick with the help of a small crystal that vibrates to power the hands. They have low-maintenance designs, making them ideal for anyone with a busy lifestyle.